I love a simple yet sorta wacky product that feels like your great aunt June in Topanga, California would wax lyrical about. That’s pretty much the defo of Lemon Rinse by Beautiful Nutrition … It’s oddly exactly as refreshing as drinking a glass of water with lemon (you know how that makes you feel like you’re the healthiest person in the world even though you’re drinking it to wash down a donut?) … it also somehow makes your shower experience very uplifting, and restores your hair’s natural shine and body. 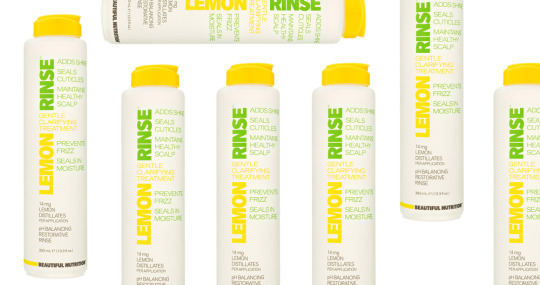 The rinse is designed to prevent frizz and seal in moisture while promoting a healthy scalp, all by balancing pH. It’s also 12,000 more appealing than pouring beer over your head or turning the shower to COLD (I’d rather die).